Written by Nicole Kohler on May 10, 2016 Blog, Marketing. One of the easiest ways to appeal to customers is with an instant discount. There’s no work involved for them — they just click, save, and feel great about getting the deal of a lifetime. You can offer instant discounts on any of your products by visiting the Product Data tab. On the first screen that appears here, labeled “General,” you’ll see an option for a product’s Regular Price, as well as a Sale Price. If you add a Sale Price, this will appear on your store with the Regular Price crossed out (although the exact behavior might vary depending on your theme). This reflects the discount shoppers will receive by purchasing the product at that time. … and shoppers will see the discount reflected on your store. You can also schedule these discounts in advance, if you prefer, using WooCommerce’s built-in time settings for discounts. Read more about setting up discounts in advance. If you schedule these discounts in advance, you can then market them to customers in advance, building excitement for your next holiday sale or event. You can even take this a step further and schedule content or social media marketing around these discounts — all in advance — saving you considerable time and hassle on the day(s) of the sale itself. To learn more about offering discounts, visit this page in our documentation about setting up and managing WooCommerce products. Customers have come to expect holiday discounts and seasonal promotions. But if you don’t offer discounts or specials during other times, your customers might begin waiting to make their purchases — after all, why buy now at full price if you know you can get a discount in a month? Keeping this in mind, not every promotion has to be planned or marketed in advance. The element of surprise can be a powerful thing, and can be just as delightful (if not more so!) than a holiday treat. So, using the same premise as above, consider adding discounts to your products. But do it in the style of a “flash sale,” where the discounts only last for a day at most, aren’t announced in advanced, and are perhaps limited to specific products. Again, using the steps outlined in Patrick’s post, you can schedule these discounts in advance if you like. Then on the day of, it’s just a matter of adding a banner, sitewide notice, or quick series of social media messages about your surprise sale. 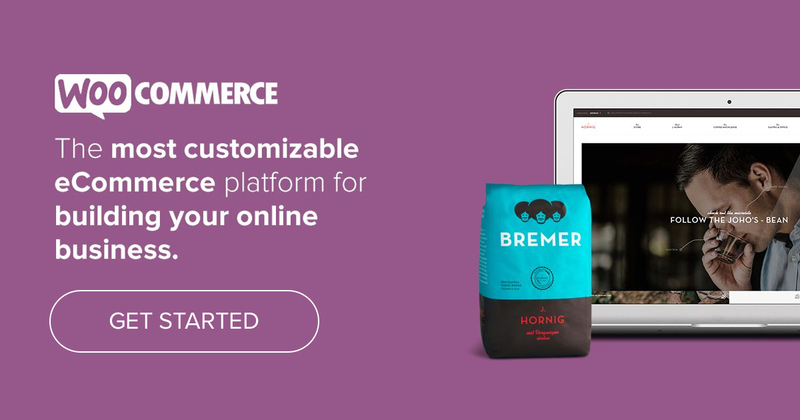 WooCommerce ships with a powerful coupon creation and management system, and with it comes a huge variety of options for extending discounts — and, in turn, moments of customer delight. Who doesn’t love a good coupon? One of the best ways to get started with sales in a new store is with a basic coupon code. These codes are usually for anywhere between 10% and 30% off an order’s total (excluding shipping and tax), and can’t be combined with other codes or deals. Some customers prefer these types of discounts because they’re straightforward. They only have to type in the coupon code and click apply, instead of worrying about which products are eligible or if their order total is high enough. As you’re adding a coupon code to your store, you might happen to notice the “Minimum spend” and “Maximum spend” filters available in the Usage Restriction tab. If you have a sharp eye, you may have spotted these options already. These options allow you to create entirely different coupons that can only be applied to orders that meet specific conditions — say, orders that are $50 and above, or less than $500. On the minimum spend side, this is a smart way to extend savings to customers while pushing them to spend more, much in the same way you would for a free shipping incentive. If you know your average order value is $40, you could offer a code for $5 off orders $50 and up. That’s an incentive for shoppers to spend more, and a minimum of $5 more than usual for you. On the maximum spend side, this can help you avoid situations where a discount could potentially cut into your margins. 25% off $200 in clothing might not be so bad, but 25% off $2,000 in appliances? Yikes. Just be careful with your wording here — you don’t want to come across as stingy. You can require products to be present for a coupon to apply, or create coupons that only work on specific categories. Talk about nitty-gritty. The tactic we’re going to recommend for most stores here is discounting specific categories, unless you have a limited selection of items; shoppers are more likely to jump on an offer of “all [category name here] 25% off” than “this particular item 25% off” unless it’s a big-ticket item that rarely ever goes on sale. To add a category discount, simply type the name of the product category (or categories) you want the coupon to apply to in the field… and you’re done! 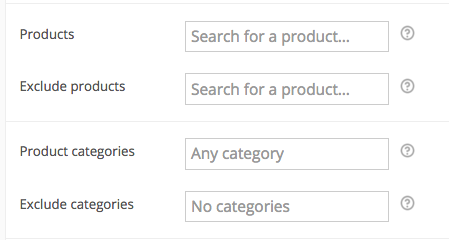 You can also exclude categories, too, in case you want the coupon code to be unusable if products from a specific part of your store are being purchased. This option is ideal if you want to offer a limited-time discount via coupon code on a specific category only — say, $10 off all men and women’s jeans. Or you can offer $10 off all jeans, but keep it from working on carts containing jeans (or other items) from your “on sale” category. Free shipping is such a popular option for WooCommerce store owners that we have an entire doc written on how to set it up. Free shipping appeals to customers because it reduces the total cost of their orders (sometimes by a considerable amount, depending on the products you ship). Shipping costs can even occasionally outweigh the costs of products themselves, leading to abandoned carts and customer complaints. Add “Free Shipping” as an available shipping method to any or all of your available Shipping Zones in WooCommerce’s shipping settings. In this example we’re adding free shipping as an option for United States customers in WooCommerce, but only if they spend $50 or more. You can even do both, or do one or the other for a limited time. So if you want to make the minimum order amount for free shipping $0 during the holidays, that’s doable. So is creating a limited-time-only coupon code that offers free shipping for orders $25 and up during the entire month of February. Customer-exclusive discounts based on email address — and more! Here’s one final option for offering your customers a discount that even you longtime WooCommerce fans might not have known about. Hovering over the tooltip will tell you the intended behavior for this functionality: coupon codes restricted by customer emails. This allows you to create coupon codes that can be redeemed only by customers whose email addresses appear on this list. Using this feature requires copy-pasting email addresses (separated by commas) into this field, so there’s a bit of manual work involved. However, for something like this we imagine you’d limit the number of customers eligible as it is. Reward specific customers with big savings — maybe they made a great suggestion, found a bug on your store, or just said something lovely about you, and you want to create one-time-use coupon codes for each person. Generate coupon codes for specific small, targeted groups — say, a code that can only be redeemed by customers who have a four or five star rating in MailChimp. Create codes for internal usage that you don’t want to be redeemed if leaked — like a 100% off discount for employees, or a 50% off discount for friends and family. Surprise random customers — create a “surprise coupon” email template, pick an email address at random, and send them a little gift. And if they sneak the code to someone else (naughty!) it won’t be usable, unless they specifically ask you to transfer it. Wondering if a new customer coupon is a good idea for your store? Use this handy, free calculator to figure it out. Whether you’re just starting out and haven’t looked into extensions yet, want to keep your discounts simple, or are just seeking out alternative ideas, these seven tips will give you the power and flexibility to run sales without needing to add on to your store. We hope they come in handy! Have any questions about the options for sales and discounts baked into WooCommerce? Or any ideas of your own you’d like to share with store owners looking to offer unique promotions to their customers? Feel free to chat with us in the comments! Speaking of discounts/coupons, I’d love to see an article on how Woo handles subscription renewals to give 50% off for a limited time and then how you swap it to to remove the 50% if x amount of time passes. From my understanding that’s not currently possible with Coupons/Memberships/Subscriptions. Hi James, I don’t know if you stopped checking comments on the previous post but I wrote about an issue in a comment that a bunch of people are having. We’d really appreciate a response! Thank you! WooCommerce is an awesome plugin! The flexibility when it comes to designing different types of sales and promos cannot be beat (the customer-email-exclusive discounts is a perfect example). We just featured you in a post on the HostGator blog of our top WordPress plugins for eCommerce, and you’re #1: http://www.hostgator.com/blog/2016/05/16/6-best-wordpress-plugins-for-ecommerce/ Thanks for being awesome! Woocommerce is a best e-commerce choice in 2016, since I switched to this system everything has become easier and immediate. I need any plugin or script for woo commerce products have timer like 1 min 45 sec then it become 0 seconds below buy button have to active. Hello srinu, at the moment we don’t have any extensions like this, but you might be able to find some custom code or a similar solution offered by third party developers with a quick search. What if some products could be buy one at 10$ or two for 15$ but only the one group, not anything else in stock?